Star Trek: Discovery Season 2 is underway, after Thursday night's premiere episode, "Brother," aired. 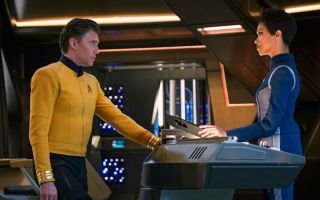 The USS Discovery has a new captain, Michael Burnham must face down (possibly literal) demons from her past, and the hunt is on for a set of mysterious signals that appear all across the Federation. Things are looking good so far for the season. Even so, it's been almost a year since Season 1 of Discovery ended, and no doubt, you've had to reallocate space in your brain for other important things in the interim. So, in case you need a refresher on what happened last time around, or if you're ready to experience the sci-fi epic for the first time, here's what you need to know about Season 2 of Star Trek: Discovery. What Is Star Trek: Discovery? Just in case you're jumping in to the show for the first time, know that Star Trek: Discovery is a serial sci-fi show that follows the adventures of Cmdr. Michael Burnham (Sonequa Martin-Green), an officer aboard a starship called the USS Discovery. Naturally, the show takes place in the same setting as the six other Star Trek series, falling in between the events of Star Trek: Enterprise (2001) and Star Trek: The Original Series (1966). Without going into too many plot details, I can tell you that Discovery features a similar mix of sci-fi, drama, action and serial storytelling as the other Star Trek shows. The new show has been somewhat divisive among longtime fans, due to canonical oddities, a darker tone and less scientific rigor than the previous shows had. But it's also an excellent piece of television, combining unpredictable character arcs and satisfying twists with a story that isn't afraid to shake up the status quo. First off, if you haven't watched Season 1, you'll definitely want to do so before watching Season 2. The episodes of Star Trek: Discovery are not nearly as stand-alone as those of The Original Series or The Next Generation, or even Voyager. This series is more like Deep Space 9 or the later seasons of Enterprise: Every episode flows right into the next. And Season 2 of Discovery expects you to have a pretty good idea of what happened in the previous 15 episodes. Burnham is the executive officer aboard the USS Shenzhou. After the ship runs afoul of a charismatic Klingon warlord named T'Kuvma (Chris Obi), Burnham mutinies against her beloved captain, Philippa Georgiou (Michelle Yeoh), in order to fight the aggressor directly. While Burnham is able to kill T'Kuvma and disable his flagship, Georgiou dies in the assault, the Shenzhou goes up in flames and the Klingons declare war on the Federation. Instead of going to a Federation prison, Burnham winds up conscripted by the hard-nosed Capt. Gabriel Lorca (Jason Isaacs) aboard Lorca's experimental starship, the USS Discovery. Here, Burnham has the opportunity to aid Lt. Paul Stamets (Anthony Rapp), a brilliant scientist who has discovered a way to traverse galactic distances almost instantaneously using advanced astromycology. As the season progresses, the Discovery and her crew fight off Klingons, rescue Starfleet officers and learn more about the mysterious "spore drive" that powers the ship. Burnham also befriends the rest of the crew, including the timid Cmdr. Saru (Doug Jones), the compassionate Dr. Hugh Culber (Wilson Cruz), the tortured Lt. Ash Tyler (Shazad Latif) and the eager cadet Sylvia Tilly (Mary Wiseman). But everything goes sideways when, just before a vital battle, Tyler snaps and murders Dr. Culber. It turns out that Tyler was a Klingon agent called Voq, secretly loyal to a cruel mistress called L'Rell (Mary Chieffo). The crew has barely any time to process this betrayal, though, before they find themselves launched into the eerie mirror universe, where the noble Federation never materialized and the iron-fisted Terran Empire rules in its place. Worse still, Capt. Lorca was an impostor from this mirror universe all along and used the crew of the Discovery to find his way home. There, he hoped to unseat the emperor, a dark parallel of Georgiou. Burnham and her crew defeat Lorca and take mirror Georgiou back to the prime timeline with them, but there's still a Klingon war to end. The crew undertakes one last daring mission to finish the fight while preserving both Federation and Klingon lives. Burnham's honor is restored; mirror Georgiou leaves for parts unknown, and the Discovery is ordered to planet Vulcan to receive its new captain. But before the crew arrives, it encounters a familiar starship: the USS Enterprise. In the first episode of the new season, we saw Capt. Christopher Pike (Anson Mount) take command of the Discovery and chase a mysterious signal to a dangerous asteroid field. There, he and Burnham rescued a stranded Starfleet medical crew, all while learning just a bit more about the signal's origins and possible implications. While our guess is as good as yours about what happens next, the Season 2 trailer that debuted at New York Comic Con gives us a few hints. Now that L'Rell leads the Klingon Empire, we'll almost certainly see how her leadership could aid — or stymie — the Discovery's new mission. Mirror Georgiou is working for the mysterious black-ops organization Section 31. And Burnham will almost certainly encounter her foster brother, Spock (Ethan Peck), and work through their complicated backstory. There was also a rather ominous message left in Capt. Lorca's ready room, but reading too much into that might venture into "fan theory" territory. Suffice to say, Lorca may cast a long shadow over Season 2. Where can I watch Star Trek: Discovery Season 2? First off, the bad news: If you live in the United States or Canada, watching Discovery is a little more complicated than watching it anywhere else in the world. In the United States, Star Trek: Discovery is available only on CBS All Access, a stand-alone streaming service that costs between $6 and $10 per month. It has a big library of CBS content, but Star Trek: Discovery is still its biggest draw. You can watch it on pretty much any streaming device. Matters are even more complicated in Canada, where Star Trek: Discovery Season 2 will air exclusively on the Space channel. You can watch episodes on demand, but you'll need a cable or satellite subscription to log in. Now, the good news: If you live anywhere except the U.S. and Canada, you can simply stream Star Trek: Discovery on Netflix. You'll still have to wait for each episode to debut week by week, though. What other Star Trek content ties into Star Trek: Discovery? In the United States, you can find all of these episodes somewhere on CBS All Access, Netflix, Hulu, Amazon Prime Video or a number of other services. Should I watch Star Trek: Discovery or The Orville? You could always watch both, but I wouldn't, personally. Originally published on Tom's Guide.